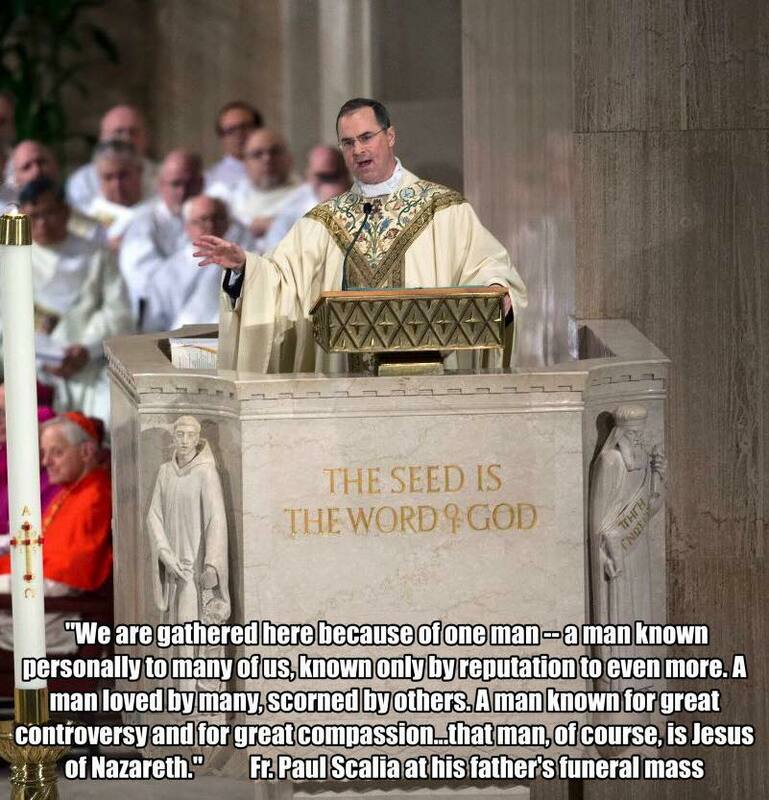 Didn't get to watch the funeral mass for Justice Antonin Scalia today. 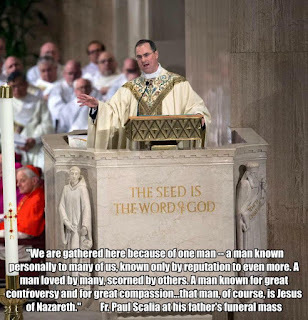 But I was happily moved when I read this excerpt from the homily delivered by his son, a Roman Catholic priest. Every Christian funeral is, in fact, a service of worship of the God made known to the world in Jesus Christ. That sometimes gets forgotten, though not as often as it is forgotten at weddings. If you would like to know the real Jesus, not the one of the TV preachers or the pols who try to use Jesus to get your vote, tomorrow would be a great day to find a church close by, so that you can worship God with the real-life Christians you'll find there. Christians come in an assortment of denominations and kinds. But if you go to the two pages linked below, you will find congregations listed, possibly some close to where you live, that are part of the two denominational bodies with which I am the most familiar. What word was born the year that you were? I've recently re-adopted the habit of praying over every room in our church building and over every seat, the pulpit, altar, baptismal font, soundboard, musical instruments, and music stands on Saturdays (this week on Friday) in our sanctuary, all in anticipation of worship on Sunday. I ask that God's Holy Spirit to rule over our church and that everything that happens in the building will glorify God and empower all who worship or participate in other church activities to share the Good News of Jesus with our world, to help us grow as Christ's disciples. As I touch every single chair in the sanctuary, I ask God to inspire, challenge, comfort, give hope, and otherwise provide for the needs--spiritual, physical, relational, and otherwise--of the people who occupy those places. I ask that God will ensure that the reading of Scripture, the prayers, the music, the preaching, and even the announcements, though not perfect because we human beings aren't perfect, will be tools in God's hands, to accomplish in those who worship what God wants to accomplish. Above all, I pray that we will truly honor, glorify, praise, surrender to, and worship God. It takes about a half-hour or longer to do this and I love doing it. I knew that I had inspired by something read years ago, but had forgotten just where. Then Leadership Journal, which is re-publishing some of its "greatest hits" online, posted this article by Pastor Jack Hayford the other day. This is the article that inspired me. I invite you to regularly pray over the facilities where your church gathers, whether you're a pastor or a layperson. Invite God to be sovereign. Invite the Holy Spirit to kick Satan and the demons who want to discourage and destroy churches out of your fellowship. Ask God to empower you to be hospitable hosts as you welcome unbelieving people and spiritual seekers into the building God has given to you. If nothing else, when you do this, you will be more prepared to worship! Check out the other suggestions made by Hayford in this classic piece. Here are some excellent thoughts on how the wisdom that comes from our faith in Christ should impact how we think about casting our vote. God isn't a Republican or a Democrat, conservative, liberal, socialist, or libertarian, of course. We should never confuse our preferred political philosophy for the Gospel. But our faith can impact how we approach exercising the privilege of the vote. Monty Williams: "Let's focus on what's important"
This is the eulogy given by Oklahoma City Thunder assistant coach Monty Williams during the funeral of his wife, Ingrid, yesterday. Ingrid Williams was killed when the car she was driving was hit head-on by an SUV. The driver of the SUV, Susannah Donaldson, was also killed. During this amazing eulogy, Williams asks for prayers for the Donaldson family as well as his own. All I have to say is that Monty Williams is an amazing man! Be sure to watch the whole thing. It will be great investment of seven minutes of your life. Discipleship, living as a follower of Jesus Christ, begins with worship. However, whenever, and wherever we first came to believe in Jesus Christ as our Savior and our God, it likely first expressed itself in worship. When the apostle Thomas, who had refused to believe reports that Jesus had risen from the grave, first realized that he had been wrong, Thomas worshiped, confessing Jesus as, “My Lord and my God!” [John 20:28] It was the true beginning of this one-time unbeliever’s life as a disciple. At a well near the village of Sychar in Samaria, Jesus told a woman: “...a time is coming and has now come when the true worshipers will worship the Father in the Spirit and in truth, for they are the kind of worshipers the Father seeks. God is spirit, and his worshipers must worship in the Spirit and in truth.” For disciples of Jesus Christ, worship isn’t confined to a time or a place. Worship happens whenever people respond to the prompting of the Holy Spirit to honestly surrender themselves to the God we meet in the crucified and risen Jesus, declaring Him to be their God and Savior. Worship then, is about an attitude of heart, mind, and will. It can even be an attitude or a posture of our bodies. The Old Testament Hebrew word for worship is shacah, literally to bow down, to prostrate oneself. The New Testament word is proskuneo, literally to kiss the hand of one we reverence. Worship then is about offering praise and honor and glory to the King of kings, anytime, anyplace. Worship is reaching up to the One Who has reached out to us through Jesus. Worship is our response to God’s grace and forgiveness in Christ. And when we worship, it isn’t about what we get out of it, but what we put into it. A clue to what worship is about can be found in the derivation of the word worship in the English language. The old word was worthship. When we worship, we reach up to God to declare Him worthy of honor and praise and the surrender of our whole lives. Until we sense that God is reaching down to us, we won’t know to reach up. Until we’re reaching up to honor and praise God, reaching in to our fellow Christians in love and support won’t make sense. Until we’re reaching up and reaching in, reaching out to others--whether by service or witnessing--will have no content. We’ll be serving without knowing who we really serve, or why or to what end. Because being a Christian disciple is not a solo endeavor, corporate worship (corporate being from the Latin term corpus for body) is essential to the Christian life. The body of Christ is called to worship together as a body and God has many reasons for why that’s so. One of them is that we need each other. Years ago, I read about a Scottish pastor who stopped by the country home of a parishioner who hadn’t been in worship for some time. In the middle of the visit, the pastor wordlessly stood up from his chair, walked to the fireplace, picked up the fireplace tongs, pulled a red hot ember from the flames, set the ember down on the stone in front of the fireplace, and sat back down. The pastor continued his visit, the parishioner occasionally stealing glances at the ember as it cooled, its color changing from bright red to dusty gray, no longer on fire. The parishioner understood that the pastor had just given him an object lesson. When we fail to worship with our fellow believers, our faith and our relationship with God goes cold and can die. Every time we worship together, we drive a knife into the heart of our presumptuous notions of not needing God, of being self-sufficient, of being gods ourselves, of not being in as much need of the grace God gives in Christ as the person sitting next to us. We also, more importantly, give God the honor and praise that is His due. But as we gather around God’s Word, around the bread and the wine, and around the font together, God also comes to us and through His Holy Spirit, re-ignites the flames of our faith and our confidence in Him again. At Living Water, we’ve come to characterize the life of Christian discipleship as reaching up, reaching in, and reaching out. Corporate worship--worship of the God we know in Jesus Christ in company with our sisters and brothers in Christ--is foundational to reaching up to God and so, foundational to a life with Christ. More next week. Today for my Quiet Time with God, I read Acts 18. Acts, as I've mentioned before, is Luke the Evangelist's account of the early history of the Church, from the ascension of Jesus through the next several decades. Acts 18 tells a little about the apostle Paul's time in the Greek city of Corinth. Acts 18:9-11 says: "One night the Lord spoke to Paul in a vision: 'Do not be afraid; keep on speaking, do not be silent. For I am with you, and no one is going to attack and harm you, because I have many people in this city.' So Paul stayed in Corinth for a year and a half, teaching them the word of God." Paul was understandably emboldened by this vision from God and he did preach and teach about the new life that can belong to all who repent and believe in Jesus Christ as God in the flesh and Savior. Just as Paul was about to speak, Gallio said to them, “If you Jews were making a complaint about some misdemeanor or serious crime, it would be reasonable for me to listen to you. But since it involves questions about words and names and your own law—settle the matter yourselves. I will not be a judge of such things.” So he drove them off. God had told Paul to speak. So, why did God allow Gallio to speak before Paul had said his peace? I can't say that I can answer that question definitively, though I think it's sort of funny how God allowed Paul to be cut off and have a guess as to why. So, Paul had decided that his ministry at that time was done with the Jews in Corinth. Instead, he would focus his attention on the Gentiles there. The moment had passed for Paul to try to persuade his fellow Jews in Corinth to follow Jesus. He had shaken himself of them. That isn't to say that at some later time, God might send others with the same message about Jesus that Paul brought. But for now, Paul's attempts to persuade his fellow Jews in Corinth was done. Paul understood this. In the next verse, we're told that Paul left the synagogue and went to the home of a Gentile believer in the God of Israel and in Jesus. Parenthetically, in Acts 18:8, we're told that Paul's mission to his fellow Jews hadn't been completely in vain either, because the leader of the Corinthian synagogue and his household had also come to faith in Christ. It's after these events that Paul receives the vision. So, to me it seems clear why God allowed Paul to be interrupted by Gallio. Paul was to speak boldly, but he was to speak to the right people at the right time. The right time had passed for Paul to speak to his fellow Jews in Corinth. For now, God wanted Paul to speak boldly to more receptive people, the Gentiles in Corinth. Verse 18 says that, "Paul stayed on in Corinth for some time." Today’s Gospel lesson starts out: ”Jesus, full of the Holy Spirit, left the Jordan and was led by the Spirit into the wilderness, where for forty days he was tempted by the devil...” If Jesus’ forty days in the wilderness, remind you of the forty years that God’s people Israel wandered through a wilderness in the Old Testament, good! The Bible means for you to connect these two events separated by 1500 years. For ancient Israel, God’s deliverance from the hands of Egypt and His miraculous parting of the sea should have been a constant reminder of God’s faithfulness, grace, and power. No test should have frightened them. No temptation should have lured them. But, as you’ll remember, whenever a new test, temptation, crisis, or idol came along, God’s people were prone to forgetting the goodness of God and all the good that God had done for them. They panicked, seeking refuge in dead idols that could not save them or in works of sin that couldn’t give them life. I can't be too critical of the ancient Israelites though. Speaking for myself, I know that I find it easy to forget God in the rush of daily life or when crises hit. Instead, try reliance on myself or on the things of this world to see me through or to make me feel strong. When I forget God, like Israel, I always make a mess of things. This is why our daily appointments with God and our weekly worship are so important. Through them, God reminds us of all we need to remember and He strengthens us with the power of His Word, the Bible. In today’s Gospel lesson, after, on the banks of the Jordan River hearing God the Father thunder from heaven, “You are my Son, whom I love; with you I am well pleased,” Jesus goes into the wilderness. He does so seeking to do what Israel was never been able to do (and what we're never able to do): Live through the tests and temptations of this life while remaining faithful to God. Jesus had to do this. The human race needed one representative who, unlike the rest of us, fulfilled God’s law and remained faithful to God’s will so that, at His death, He could take the punishment that each of us deserves for our sin. In the wilderness, long before He went to the cross, Jesus met the temptation to dodge His mission and forgo His ministry, which, had He caved in, would have left us dead in our sin for eternity. But don’t let all of this history make your eyes glaze over, because Jesus’ time in the wilderness also gives us a model for daily godly living. We are saved by God’s grace through faith in Christ. And out of gratitude for that grace, we seek through daily repentance and renewal and by the way we live to express our thanks to God for it all. In today’s Gospel lesson, Jesus shows us how to face our tests and temptations in life. We face them first, like Jesus, relying on the Holy Spirit. In our Baptism, God gives to the baptized the same Holy Spirit Who filled Jesus and led Him into the wilderness. In our daily lives as Christians, we can tap into the power of the Holy Spirit as we deal with situations at home, school,work, and leisure. And we do that by praying, by reading God’s Word, and by living in fellowship with God’s people in the Church, people, who like us as believers in Christ, stand under God’s Word as the ultimate authority over our lives. Let me make this promise to you: If you will take the time before diving into any decision--to be still, to know that God is God, and to seek God’s counsel through Christ--you will make more right decisions, more decisions you don’t regret, and you will experience God’s peace. That's the simple truth. In facing life’s temptations, we need to do so in the power of God’s Holy Spirit. But let’s quickly look at the three temptations Jesus faced to learn more about facing down temptation and tests. The devil was taunting Jesus. Temptation often comes to us in this way. “If you’re so sure of yourself…” “If you think you’re so tough…” “If you’re certain that you’re all that…” "If you think you know what you're doing..."
Jesus didn’t let the devil’s taunting bother Him. He knew that He was God’s own Son and that the Father was pleased with Him. The Christian lives in this world knowing that we don’t need to pull any power trips, we don’t need to do anything to prove our worth. Jesus Christ already proved our infinite and eternal worth in the eyes of God when He died on the cross and rose from the dead for us. Through our Baptism in the name of the Father, Son, and Holy Spirit, and our faith in Christ, we own the same title that Jesus bears: Child of God. In this first temptation, the devil was also preying on Jesus’ weakness. Jesus was not only God, but also a man who, after forty days in the wilderness, was hungry. The devil was challenging Jesus to use His power in a way that Jesus never used it: for Himself. The God we know in Jesus Christ is all you and I need. He has our backs here. He has our backs for eternity. Temptation two is shown in Luke 4:5-6. The devil showed Jesus all the kingdoms of the world and said that if Jesus would worship him, the devil, he would give all those kingdoms to Jesus. We are tempted to idolatry, the worship of things or people other than God, because we think they can assure us of good lives, maybe even easy lives. We worship idols as shortcuts to blessings only the God of the universe can give. The devil knew that Jesus had come to claim the people of the world for God. The devil was offering Jesus a shortcut, a less personally painful way claiming the world. Watch out for shortcuts! But Jesus didn't come into the world to conquer its kingdoms by domineering people; Jesus came to conquer our greatest enemies--sin and death--by going to the cross and the tomb. All who believe in Jesus become part of something that lasts longer than all the kingdoms, corporations, nations, fads, Twitter trends, or dictatorships of the world, the eternal kingdom of God. Jesus refused the devil, saying He would only worship God. We are called to do the same thing every day of our lives. In temptation three, the devil twists the Word of God, trying to entice Jesus to throw Himself off the pinnacle of the temple in Jerusalem. Some scholars believe that the pinnacle rose seven hundred feet from the the temple’s base. God, the devil said, would catch Jesus. The devil pulled a few passages from the Old Testament out of their context, not taking into account everything God says in His Word to tempt Jesus, to try coaxing Jesus into jumping. Jesus knew God’s Word and because He did, He was ready to face whatever the devil or this world threw at Him. We need to know God’s Word for the same reason. remember that only God is worthy of our worship and lives lived in response to His grace; and always recall that by steeping ourselves in God’s Word, we are ready for anything. Tests come in this life, temptations too. As someone has said, in this life, you're either coming into a storm, you're in a storm, or coming out of a storm. But we need not be overcome by any of these things. As we surrender to Christ each day, we belong to God and through Jesus, we know that God is bigger than any temptation, any test, any challenge, even death.